One of my favourite actresses playing one of my all-time favourite characters in the Kingdom of Fantasy literature. This is what she had to say when asked about her playing Galadriel again. Galadriel is a special character to me, mythic and fascinating. It was as enjoyable to shoot as Lord of the Rings. When I wore the elf ears again, I had this wonderful feeling of dejá vú. I couldn’t stop laughing. 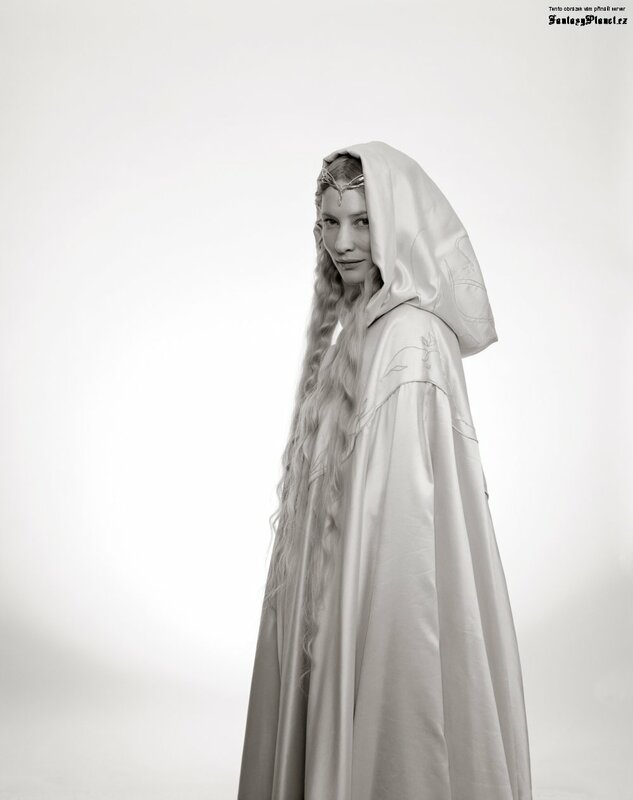 I was very young when I played Galadriel. I hope to have evolved, to be a better actress, person and mother. Professionally I think I’m much more flexible now, and easier to work with. I know Peter thinks so! (laughs) Come Christmas the audience will be able to decide for themselves. Catherine Élise “Cate” Blanchett (born 14 May 1969) is an Australian actress and theatre director. She has won multiple acting awards, most notably two SAGs, two Golden Globe Awards, two BAFTAs, and an Academy Award, as well as the Volpi Cup at the 64th Venice International Film Festival. Blanchett earned five Academy Award nominations between 1998 and 2010. Blanchett came to international attention for her role as Elizabeth I of England in the 1998 film Elizabeth, directed by Shekhar Kapur. She is also well-known for her portrayals of the elf queen Galadriel in Peter Jackson’s The Lord of the Rings trilogy and the upcoming The Hobbit, Colonel-Doctor Irina Spalko in Indiana Jones and the Kingdom of the Crystal Skull and Katharine Hepburn in Martin Scorsese’s The Aviator, a role which brought her an Academy Award for Best Supporting Actress. She and her husband Andrew Upton are currently artistic directors of the Sydney Theatre Company. It was announced that Blanchett will reprise her role as Galadriel in Jackson’s upcoming films of The Hobbit in 2012 and 2013. Galadriel is a character created by J. R. R. Tolkien, appearing in his Middle-earth legendarium. She appears in The Lord of the Rings, The Silmarillion and Unfinished Tales. She was a royal Elf of both the Noldor and the Teleri, being a grandchild of both King Finwë and King Olwë, and was also close kin of King Ingwë of the Vanyar through her grandmother Indis. Towards the end of her stay in Middle-earth she was co-ruler of Lothlórien along with her husband, Lord Celeborn, and was referred to variously as The Lady of Lórien, The Lady of the Galadhrim, Lady of Light or The Lady of the Wood. She had a daughter Celebrían, making her Elrond’s mother-in-law and Arwen’s grandmother. Tolkien refers to her as “the mightiest and fairest of all the Elves that remained in Middle-earth” (after the death of Gil-galad) and the “greatest of elven women”. Galadriel was originally named Artanis (Q. ‘ar’=noble, ‘nis’=woman, a name common to royal women of the Elves, most prominently as in the form Arwen, Galadriel’s granddaughter), and Nerwen (Q. ‘ner’=man, ‘wen’=maiden, hence manly maiden), referring to her height and strength; Galadriel is the Sindarinized version of Telerin Quenya Alatáriel (Q. ‘alatá’=radiance, ‘riel’=maiden crowned with a garland), a name given her by Celeborn, referring to her silver-golden hair. 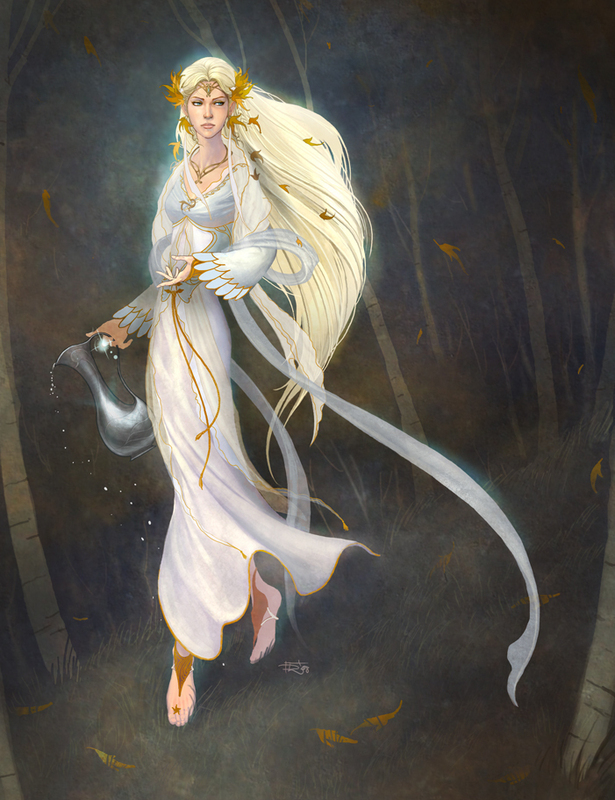 The name Galadhriel (S. ‘galadh’=tree, ‘riel’=crowned maiden) was used outside Lórien by the people who did not know the ancient days and Galadriel’s history, confusing galad with the Sindarin word galadh and the name of the Galadhrim, the people of Lórien. As the ruler of Lothlórien, she was referred to by a variety of titles, including “Lady of Lórien”, “Lady of the Wood”, and (by Gimli) “Queen Galadriel” — although, according to Tolkien’s account in Unfinished Tales, neither she nor Celeborn took royal titles themselves, as they considered they were but guardians of Lórien. She was also referred to as “Lady of Light” (the translation of Galadriel) or as the “White Lady”, as her fair skin and white cloaks made her seem to shine. It was said (by the Dúnedain) that her height was two rangar (Q. ‘rangar’=stride), or “man-high” – about 6 ft. 4 in., or 193 cm. However, Galadriel’s most striking feature is her beautiful long silver-golden hair. The Elves of Tirion said it captured the radiance of the Two Trees Laurelin and Telperion themselves. “Even among the Eldar she was accounted beautiful, and her hair is held a marvel unmatched. It is golden like the hair of her father and of her foremother Indis, but richer and more radiant, for its gold is touched by some memory of the starlike silver of her mother; and the Eldar say that the light of the Two Trees, Laurelin and Telperion, has been snared in her tresses.” It was greatly admired by Fëanor and may have inspired him to create the Silmarilli. “Many thought that this saying first gave to Fëanor the thought of imprisoning and blending the light of the Trees that later took shape in his hands as the Silmarils. For Fëanor beheld the hair of Galadriel with wonder and delight.” Nevertheless, she never repays Fëanor’s admiration with the generosity she shows to Gimli the Dwarf in The Fellowship of the Ring. Fëanor had begged her thrice for a tress and thrice she refused to give him even one hair. It is said that these two kinsfolk, being considered the greatest of the Eldar of Valinor, remain unfriends forever. Her character was similarly a blend of characteristics of the kindreds of the Eldar from whom she was descended. She had the pride and ambition of the Noldor, but in her they were tempered by the gentleness and insight of the Vanyar. She shared the latter virtues of character with her father Finarfin and her brother Finrod. “She was proud, strong, and selfwilled, as were all the descendants of Finwë save Finarfin; and like her brother Finrod, of all her kin the nearest to her heart, she had dreams of far lands and dominions that might be her own to order as she would without tutelage. Yet deeper still there dwelt in her the noble and generous spirit of the Vanyar, and a reverence for the Valar that she could not forget. From her earliest years she had a marvellous gift of insight into the minds of others, but judged them with mercy and understanding, and she withheld her goodwill from none save only Fëanor. In him she perceived a darkness that she hated and feared, though she did not perceive that the shadow of the same evil had fallen upon the minds of all the Noldor, and upon her own.” Her sympathy for Gimli the Dwarf in Lothlórien, when she rebuked her husband Celeborn for being tempted to regret his decision to admit the Dwarf to that land, won Gimli’s heart forever. She was said to be a match for both the loremasters and athletes of the eldar. She was the mightiest of the women of the Eldar. Stories of Galadriel’s life prior to The Lord of the Rings appear in both The Silmarillion and Unfinished Tales. Galadriel was the only daughter and youngest child of Finarfin, prince of the Noldor, and of Eärwen, who was cousin to Lúthien. Her elder brothers were Finrod Felagund, Angrod, and Aegnor. She was born in Valinor during the Years of the Trees. In The Silmarillion Galadriel is portrayed as having some power of telepathy, she is described as having been “blessed with the ability to peer into the minds of others and she judged them so fairly. But in Fëanor, she only sees darkness”. As one of the members of the royal house of Finwë and having the blood of the Vanyar from her paternal grandmother, Indis, she was often called the fairest of all Elves, be it on the shores of Aman or of Middle-earth. According to the older account of her story, sketched by Tolkien in The Road Goes Ever On and used in The Silmarillion, Galadriel was an eager participant and leader in the rebellion of the Noldor and their flight from Valinor: in fact the “only female to stand tall in those days”. As a leader of the Exiles, she was forbidden by the Ban of the Valar to return to the Undying Lands. She was, however, completely separated from Fëanor and his kin, and did not participate in the Kinslaying at Alqualondë. Once in Beleriand, she lived mainly with one of her brothers, Finrod Felagund of Nargothrond, but spent much time at the court of Thingol and Melian in Menegroth, from whom she learnt many things concerning Middle-earth. 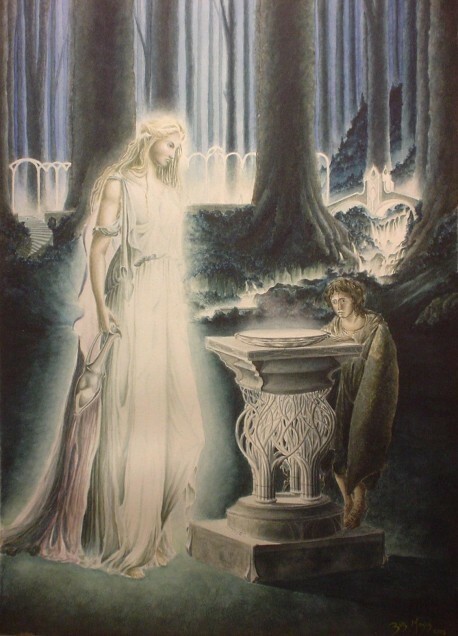 In this account she met Celeborn, a kinsman of Thingol, in Doriath. Unfinished Tales gathers many other accounts of Galadriel and Celeborn. One of these highlights a second version of how Galadriel came to Middle-earth. She lived with her mother’s kindred in the Telerin port of Alqualondë and there met Teleporno, later known as Celeborn, who would become her husband and co-ruler. Celeborn, by this account, was Olwë’s grandson. Galadriel and Celeborn sailed from the West and came to Beleriand separately from the two main hosts of the Noldor (one that Fëanor led in the ships of the Teleri, the other that crossed Helcaraxë). Galadriel was thus not directly involved in the revolt of the Noldorin princes in this version, and indeed fought against them at Alqualondë during the kinslaying; but she fell under the Ban of the Valar because she left the Undying Lands without permission. Once in Beleriand she and Celeborn were welcomed by Thingol and lived in Doriath. Once the Noldor arrived in Beleriand, Galadriel re-established contact with her brothers. In this version of the story, she is offered a pardon by the Valar, but refused it out of pride and therefore remained under the Ban. In even later accounts from Unfinished Tales, written not long before Tolkien died, Galadriel was not even subject to the Ban, and remained in Middle-earth of her own volition. In both versions Celeborn plays no important role in the Battles of Beleriand; he and Galadriel left Beleriand before the War of Wrath. They travelled first to Lindon, where they ruled over a group of Elves, probably as a fiefdom under Gil-galad. Later they moved eastward and established (or were welcomed into) the realm of Eregion or Hollin. At this time they made contact with a Nandorin settlement in the valley of the Anduin, which later became Lothlórien. At some point Celeborn and Galadriel left Eregion (where Celebrimbor either had been or now became the ruler) and settled in Lothlórien. According to some accounts, they became rulers of Lothlórien for a time during the Second Age; but in all accounts they returned to Lórien to take up its rule after Amroth was lost in the Third Age. Celeborn and Galadriel had a daughter Celebrían, who later married Elrond Half-elven of Rivendell, thus making Galadriel and her husband Celeborn the grandparents of the twins Elladan and Elrohir and their younger sister Arwen Undómiel, future Queen of the Reunited Kingdom of Gondor and Arnor. During the Second Age, when the Rings of Power were forged, Galadriel distrusted Annatar, the loremaster who taught the craft of the Rings to Celebrimbor and the other Noldor of Eregion. This distrust was justified, for Annatar was revealed as Sauron pretending to be an emissary from the Vala Aulë. When Sauron attacked Eregion, Galadriel was entrusted with one of the Three Rings of the Elves. Her Ring was Nenya, the Ring of Water or the Ring of Adamant. Conscious of Sauron’s power and wishing to thwart it, she did not use the Ring so long as the One Ring was in his hands. However, during the Third Age, when the One Ring was lost, she put hers to use in making Lórien a fair refuge for the Nandor in the years after the departure and loss of Amroth and Nimrodel. Galadriel maintained constant vigilance against Sauron and often strove with him in thought. Sauron was said to have great desire to see into her mind, but could not so long as he did not have the One Ring. By this time, with the death of Gil-galad in the War of the Last Alliance, Galadriel had become the most powerful of the rulers among the elves in Middle-earth, and the foremost of the remaining Exiles. During the latter part of the Third Age, when Lothlórien was closed to outsiders, the Lord and Lady of the Galadhrim maintained communication with Imladris, but less so with the Silvan Elves of Mirkwood. In The Fellowship of the Ring, Galadriel hosted the Fellowship in Lothlórien after their escape from Moria. When she met the Fellowship in her tree dwelling at Caras Galadhon, she gave each member a searching look, testing their resolve — though Boromir interpreted this test as a temptation. She was in turn tested when Frodo Baggins offered to place the Ring in her keeping. Knowing that its corrupting influence would make her “great and terrible”, and recalling the ambitions that had once brought her to Middle-earth, she refused the Ring. She accepted that her own ring’s power would fail and that her people would diminish and fade with the One Ring’s destruction, and that her only escape from the fading of the Elves and the dominion of Men was to return at last to Valinor. 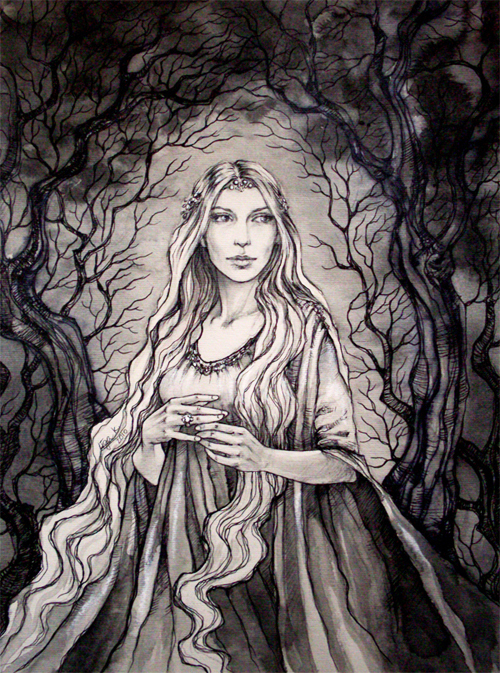 There is the suggestion in the novel, backed up by other writings, that at the critical moment when she held her own ring Nenya aloft and looked towards the West, rejecting the temptation to take the One Ring, her personal ban from Valinor was lifted and she was finally given leave to return over the sea. When the Fellowship left Lothlórien, she gave each member a gift and an Elven cloak, and outfitted the party with boats and supplies, both as practical support and as a symbol of faith, hope, resignation and goodwill. After Sauron perished, Celeborn led the host of Lórien across the Anduin and captured Dol Guldur. Galadriel came forth and “threw down its walls and laid bare its pits”, recalling the deeds of Lúthien Tinúviel, who did the same at Tol Sirion in the First Age. Galadriel passed over the Great Sea with Elrond, Gandalf, and the Ring-bearers Bilbo and Frodo Baggins, marking the end of the Third Age. Celeborn remained behind, and Tolkien writes that “there is no record of the day when at last he sought the Grey Havens”. It is her refusal of the One Ring that lifts the Ban (along with her service in the war against Sauron) and finally allows her to return to Valinor. Of the Noldorin exiles, she is the only one of prominence to return. She was aged well over 7,000 years at that time, second only to Círdan the Shipwright.